Hello to you and happy #wineWednesday. I hope your week has been fantastic. I had a good one – I connected with two of my BFFs on Friday night for dinner and then hosted 15 people on Saturday for a backyard BBQ. There were bottles of wine, lots of laughter and great conversation – lots of it ‘wine’ focused. It got me to thinking…what is my favourite ‘wine’ story? Do I only have one or do I have several? So, in the spirit of my ‘mostly-sober-September’ (my summer was wonderful and my liver needs a rest), I am going to share stories of special wine moments I’ve had that I treasure and think upon fondly. My first instalment is the story of my 40th birthday. My husband David asked me what I wanted for my 40th. I said, “To wake up in New York City.” “Done,” was his response and he went about booking flights and I went about booking accommodations. At this point in my life, I knew I loved wine and had just completed my WSET Level 2. When David and I went out for dinner, mostly I ordered a glass of wine and he ordered a cranberry juice or water with no ice. Once in a while we would share a bottle of wine for a birthday or anniversary but it wasn’t the ‘norm’. So, I made reservations at a wonderful restaurant for my actual birthday dinner months in advance as I am a bit of a planner and David believes ‘it will all work out’. Personally, I didn’t want to be stressed about where to eat and what to wear so away I went to Trip Advisor to find my ‘spot’. It was Basso56 Restaurant and it received great ratings and the food was a constant winner. Check. I looked over the wine list and I started drooling. Check. I had a feeling this was going to be an outstanding evening. We arrived at the restaurant to a modest door front entrance and went downstairs into the restaurant. I looked behind me thinking ‘umm – not sure here’ – and David beamed at me and said “I already love it!” Exhale. OK – this is going to be a great. We sat down at a table that was scrunched in by the kitchen. The host could tell we weren’t too happy so he asked for a moment, went to the host station, checked his notes, came back with apologies that it was my birthday and that I had booked so far in advance – please come to another table. Perfect. Our server was the amazing Alfredo and he charmed us with his smile and easy way of being. I had a glass of Prosecco ( I hadn’t become the Champagne girl I am now ) and David had a Limoncello on ice. I knew the night was falling into a ‘favourite moment’ category when he started with a liqueur/aperitif! It was time to order and we both said what we wanted and Alfredo asked if we wanted wine for our meal. David said, “Yes, I think we should order a beautiful bottle of Barolo.” I almost fell off my chair. How the heck did he know about Barolo? Never once did he mention this type of wine that I happen to be in love with and the Nebbiolo grape it is made from? Who was this man sitting across from me in a NYC restaurant? I fell a bit more in love with him right then and there. Alfredo helped us navigate the Barolo options and we chose a Barolo Riserva, Damilano 1999. Alfredo walked away from the table and I sat, starting at this beautiful man in front of me, who I was lucky enough to call my husband and best friend. He surprised me that night and we had the most wonderful dinner and evening, including dashing out of a taxi cab in the middle of Times Square to run up the neon red staircase. 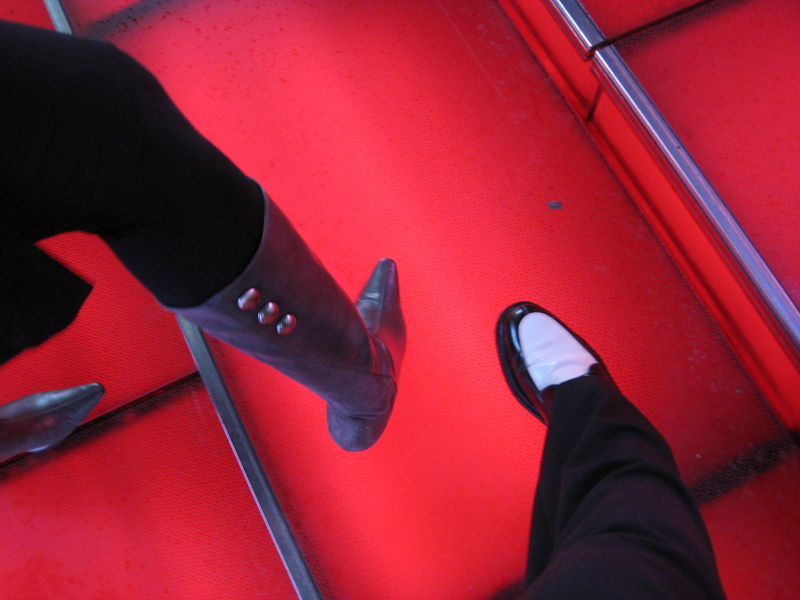 I may not have been wearing glass slippers, but I sure felt like a princess holding the hand of my prince on ruby red stairs underneath the neon glow of NYC.